The designation of Archbishop of Canterbury is an ancient office tracing its origins to St Augustine in 597AD. He is the head of the Church of England and of the worldwide Anglican Communion. 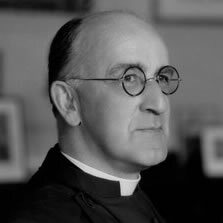 In the long and distinguished list of these archbishops only one has been a freemason: The Most Reverend and Right Honourable Dr Geoffrey Francis Fisher, GCVO (a distinction created for him in 1953, shortly after the Coronation) (1887-1972)1. Perhaps he remains best known as the clergyman who not only married The Queen but also placed St. Edwards Crown on her head at her Coronation some five and a half years later. He took to freemasonry, as he did to all aspects of his life, with gusto, joined orders beyond the Craft and participated in its affairs to his dying day. Four other Archbishops of Canterbury (Arthur Ramsey 1961; Frederick Coggan, 1975; Robert Runcie, 1980 and George Carey 1991) bridged the gap between Fisher and the current Lord Archbishop The Most Reverend and Right Honourable Rowan Williams. None appear to have made as much an impact on the Church and Society in general as Geoffrey Fisher did. His high rank and profile as a Churchman and simultaneous activities as a freemason did not escape the notice of those who wished to decry freemasonry. His dignity and pride in the Craft overcame all criticism. Geoffrey was the last of 10 children, born near Nuneaton in Warwickshire on the 5th of May 1887. The Fishers have a long-standing pedigree tracing their priestly origins as far back as the last decade of the 10th century and a monk named John Fisher, in the Anglo-Saxon Benedictine Abbey of Burton. His father Henry, a gentle and scholarly hyperactive priest and his good-natured loving mother encouraged Geoffrey to pursue his inclination toward an academic life. He was well prepared when he took the post of assistant master at his old school Marlborough in 1911. Deviating from family tradition, he went up to Oxford in 1906, instead of Cambridge, which his immediate ancestors had all preferred. He enjoyed the antiquity and ambiance of Exeter College founded in 1314. Qualified now in Theology he was ordained a priest ordained as a priest on 18 March 1913 at Wells Theological College in Salisbury and a year later, at the astonishingly young age of 27, he was appointed Headmaster of Repton, the 16th century prestigious and respected public school in Derbyshire. It is during his headmastership that Geoffrey Fisher was initiated into the Old Reptonian Lodge No. 3725 at Freemasons Hall, London on 11th January 1916. He was passed in October and made a Master mason on 9th January 1917. This was the start to a long and continued successful Masonic career. Records of his undoubtedly successful 18-year stint as headmaster at Repton are scattered with incidents, which show him to have been both strict and at times ruthless in pursuing what he saw as justified discipline. Bro the Rev Neville Barker-Cryer, my colleague and well known Masonic historian, told me that he was appointed a clergyman by Geoffrey Fisher in 1959 at Adiscombe and at the time, and on various occasions that followed, Geoffrey Fisher never deviated from a scholastic, master to pupil approach in his communication with fellow priests and parishioners. In January 1926 Bro Fisher became a joining member of Tyrian Lodge now No. 253 in Derby. The Lodge takes pride in having had no less than three Grand Chaplains of the United Grand Lodge of England as members. The other two being the Reverend L.D.H. Cokburne, LLD, who acted as such 1817-26, and was a joining member of the Lodge of Antiquity No. 2 and the Rev Neville Barker Cryer who, after 50 years of membership, is a Past Master of the Lodge. Notwithstanding the proximity of the Derby Lodge, Bro Fisher continued to attend his mother lodge in London and presided as Master during the course of 1928, whilst still headmaster of Repton, having been installed on the 10th of January of that year. It was almost a natural progression, on 13th March 1928, to be exalted into the Chapter of Justice No 253, which is attached to the Tyrian Lodge. It would appear that Companion Fisher did not embrace the Royal Arch with the same enthusiasm as he had for the Craft. The Chapter records show that he did not attend any meeting after his exaltation, notwithstanding the fact that his colleague the Bishop of Derby was also a member of the Chapter. Meanwhile his clerical career was developing comfortably when circumstances took over his mundane intentions. Wishing to take a post as a county parson in family tradition, he stepped down as headmaster of Repton in 1932, when, to his surprise and undoubted delight, on 6 May 1932 he received a letter from the Prime Minister, Ramsay MacDonald informing him of his pending appointment, in September, as the Bishop of Chester. This was Geoffrey Fishers launch to high rank and fame. He resigned from both the Tyrian Lodge and the Chapter of Justice in June and September 1932 respectively as he moved into his new residence, the Bishops House, in the ancient and prestigious Bishopric of Chester. The flood of letters and official communications, which followed, congratulating him on his joining the bench of Bishops, was a testament to his popularity and the support he enjoyed. He was about to embark on a new career and once more he was prepared to take on the new challenges with enthusiasm and determination. During the next seven years he established himself as an individualist. Innovative in his routine duties and a considerate and concerned ecclesiastic leader. He excelled as a money-conscious administrator of Church affairs, most especially in the field of clerical legislation. These qualities and experience served him well for the future. Having settled down, on 22 January 1935, the busy year of the Silver Jubilee of King George V, he joined the relatively new, five year old St Anselm Lodge No. 5166 meeting at Freemasons Hall in Chester. It only took him a year to be elected Master of the Lodge and to gain the Provinces recognition by being appointed Provincial Grand Chaplain. A year later, in 1937 he was given the high rank, one of two such acting ranks given each year, of Grand Chaplain of the United Grand Lodge of England and was again appointed two years later, shortly before being translated from Chester to become Bishop of London. The Masonic honours were as deserved by him as they were gratifying to freemasonry in general and the many Brethren he had endeared himself to in his Masonic career. He fulfilled his duties in Chester to the utmost satisfaction of his peers and in April 1939, as war was about to break, he was offered the see of London by the Prime Minister, Neville Chamberlain. Fishers response, in his own words, was to kneel and weep like a child, in spiritual anguish, fear and apprehension at what was awaiting him. He was in the prime of his manhood, with a fresh mind and a scholar intellectually gifted. London, in spite of the very difficult period, was to greatly benefit by his six-year spell. Throughout the dangerous war period he chose to remain in Fulham Palace, his official London residence and serve at St. Pauls Cathedral in the very heart of the City. His many responsibilities were onerous and went beyond the call of duty. He proved himself to be courageous and a caring and dedicated, cooperative minister of the Church. Whilst in London, he made important friends and contacts, not least with the Royal family. This was a time when it was fashionable to be a freemason. King George VI was an overt supporter and active member of the Craft, having served as Provincial Grand Master for Middlesex and accepting the rank of Past Grand Master on his unexpected accession to the throne in 1937. Geoffrey Fisher had reached the top of his profession and there were many members of the clergy, not so prominent, who were also active freemasons. His appointment to the highest office an Anglican clergyman can aspire to attain took place at the end of the war in 1945 and lasted until 1961. As the Archbishop of Canterbury, his contributions to so many aspects of the religious and social structure in England had a telling effect on millions of individuals. Yet he will remain best remembered for the coronation of Queen Elisabeth II in Westminster Abbey on 22 June 1953, which followed on his marrying the then Princess Elisabeth to Prince Philip, the Duke of Edinburgh in 1947. As the Archbishop of Canterbury, Geoffrey Fisher broke new ground in many areas. He had to cope with significant problems brought about by the rebuilding and peace process that followed the Second World War. He became a great traveller, the first Archbishop of Canterbury to visit Australia in 1950. He visited New Zealand, all parts of Africa and the Far East, as well as Turkey, Egypt, Cyprus and, famously, Jerusalem in 1960 prior to a meeting with the Pope in Rome, the first such meeting since the reformation in the 16th century. He was particularly active in the World Council of Churches and the revision of the Canon Law. He was an influential man and his contributions to education in particular and his political and social views have remained as part of his legacy to the present time. As to freemasonry, he continued with his membership and gradually decreasing attendance of his lodges. He is recorded as having visited, for the last time, his mother Lodge, Old Reptonian No. 3725 in 1939. In February of 1965, at the ripe old age of 78, he resigned from St Anselm Lodge No. 5166 in Chester and at the next meeting in October of the same year he was made an honorary member. A great man who derived much pleasure and pride from the Craft and whose Masonic involvement has been of great moral and practical benefit to us all. Brother Geoffrey Fisher died peacefully on 15 September 1972 in the small village of Trent in Dorset, having achieved the greatest ambition of his heart, to become the assistant parish priest. As a post-script, there is an interesting Masonic connection with the current and the 104th Lord Archbishop of Canterbury, The Most Reverend and Right Honourable Rowan Williams, who, following on an exchange of letters some weeks after his appointment, wrote to the Grand Secretary on 23rd January 2003 Since my late father was a member of the Craft for many years, I have had every opportunity of observing the probity of individual members. . . . . I welcome the manner in which Freemasons have engaged in debate and especially the increasing openness of recent years. Their commitment to charitable causes and the welfare of the wider community is beyond question. Cocke, The Rev J F, Headington, Oxford published and private correspondence. Phillips, Denzil, Scribe E of the Chapter of Justice No 253 with thanks for guidance.